Pedro did his PhD at the University of Bristol (2004-2007) funded by a Marie Curie grant from the EU. After a short stage in the European Molecular Biology Laboratory (EMBL, Heildelberg, 2007-2009), he joined the Cardiovascular Research Centre at the University of Girona (2009), where he gained a Sara Borrell Postdoctoral Fellowship from the Spanish Government (2011-2014). 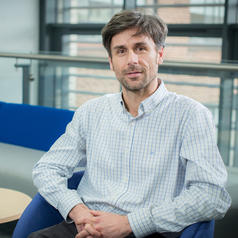 Pedro then joined the University of Hull in 2015 as a Lecturer. My group is interested in how proteins' post-translational modifications change during cardiac disease, e.g. heart failure and atrial fibrillation. Within the 200 or so known post-translational modifications, we are particularly interested in arginine methylation, phosphorylation, and N-terminal acetylation. We look at post-translational modifications both from a systems biology approach (proteome level), and from a reductionist approach (often using NaV1.5 as a model system). We use a range of biochemical and molecular biology techniques, often including mass spectrometry and proteomic approaches.